This dish was inspired to our most recent trip to Mozza Pizzeria. It’s Mario Batali’s pizza joint that we frequent a little too often. Instead of pizza like we usually get, we opted to try a few of their appetizers. One in particular we both fell in love with and of course I had to come up with some sort of spin on it. 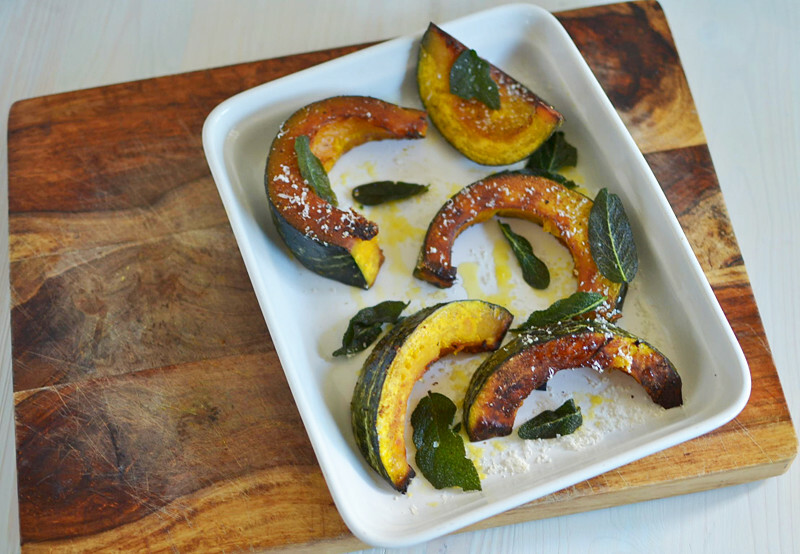 It was roasted delicata squash, cut into slices and then topped with sizzling brown butter, fried sage and freshly grated Parmigiano and ameretti cookies. Yes…I said cookies. It was pretty amazing The squash was roasted and carmalized on the outside and tender on the inside and well, you can go wrong with brown butter, but what did it was the cheese and almond cookies, it really took the dish over the top. Now I didn’t exactly make it like Mario did. I couldn’t find delicata squash and didn’t pick up ameretti cookies, but trust me this is on my list. I even snatched their menu so I could remember the ingredients. Desperate, I know. So we had to work with what we got, which was kabocha squash. Almost a close second and roasts beautifully. This is a tricky squash like other hard gourds where you need someone strong that has a sharp knife to cut into this bad boy. Instead of butter (I know, how could I?) I melted some coconut oil and drizzled atop the wedges. I sprinkled a dusting of curry and brown sugar and let those babies roast. What emerged was a sweet and savory roasted gourd that made the whole kitchen smell amazing. 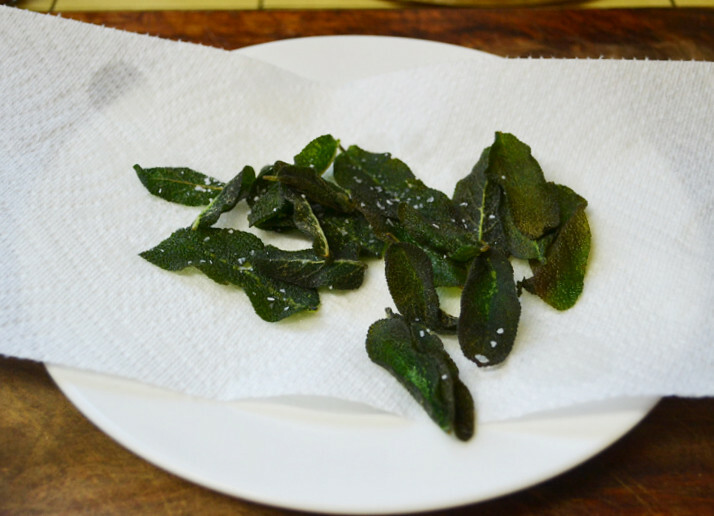 I couldn’t stop there of course and offered a healthy grate of fresh Parmigiano and topping it with crispy fried sage. 1) Prep and fry sage and set aside. You can learn how to fry sage here. 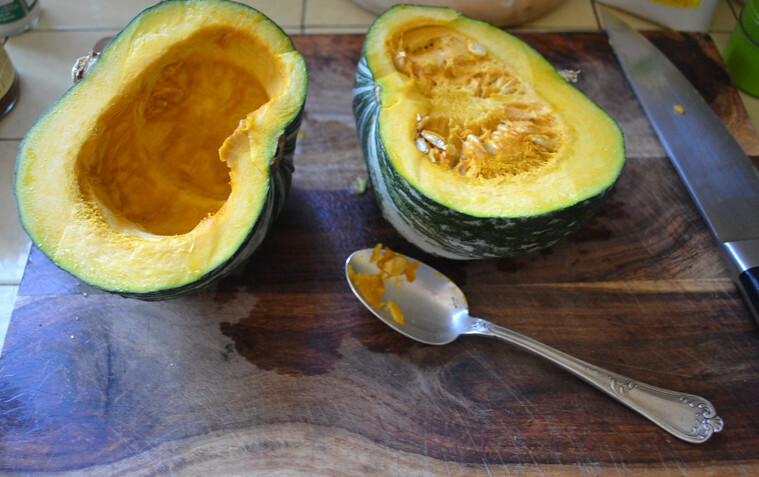 2) Next scrub the outside of the Kabocha squash and with a very sharp knife and someone who has some strong hands, carefully cut it in half and scoop out the seeds. 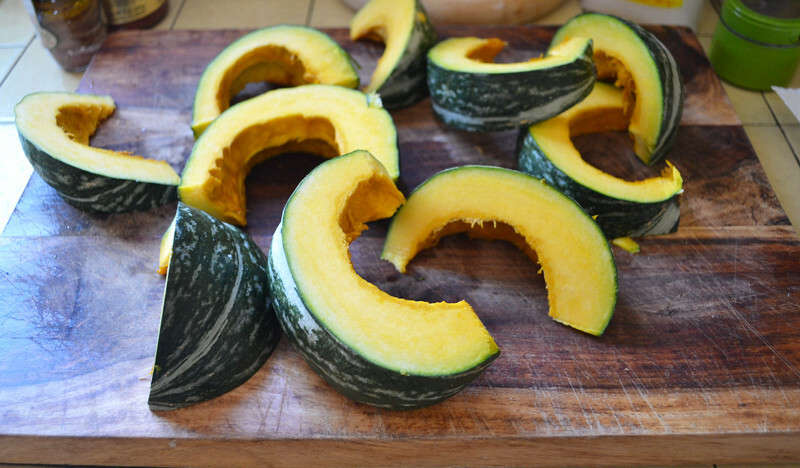 3) Lay the squash halves on their flat side and again with a sharp knife and a strong person, cut them into wedges. 4) Place squash on a foil lined baking sheet and drizzle with melted coconut oil, salt, pepper, curry and dust the top with brown sugar. 5) Roast in oven at 400 degrees Fahrenheit for a total of 30 minutes. Turn wedges over half way through. 6) When done, top with freshly grated Parmigiano and fried sage. Prep and fry sage and set aside. You can learn how to fry sage here. Next scrub the outside of the Kabocha squash and with a very sharp knife and someone who has some strong hands, carefully cut it in half and scoop out the seeds. Lay the squash haves on their flat side and again with a sharp knife and a strong person, cut them into wedges. 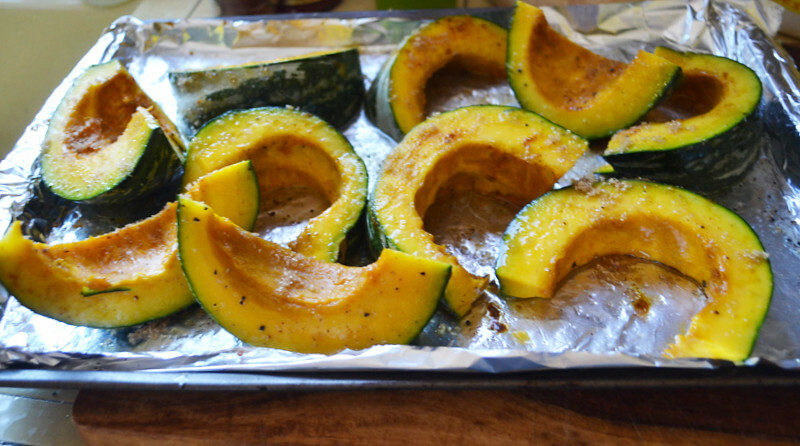 Place squash on a foil lined baking sheet and drizzle with melted coconut oil, salt, pepper, curry and dust the top with brown sugar. Roast in oven at 400 degrees Fahrenheit for a total of 30 minutes. Turn wedges over half way through. When done, top with freshly grated Parmigiano and fried sage. Ah, so this is what you did with the squash! It looks delicious. I can not speak English well, sorry i try it but still. 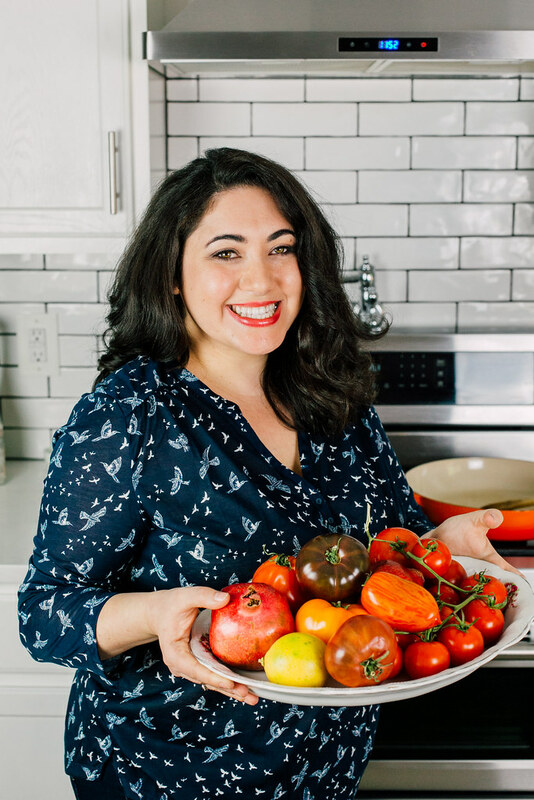 Hello I just found her blog on foodgawker and I was laughed at kleich the pumpkin. Maybe that helps even a little further, unfortunately, is German but maybe someone helps you translate? 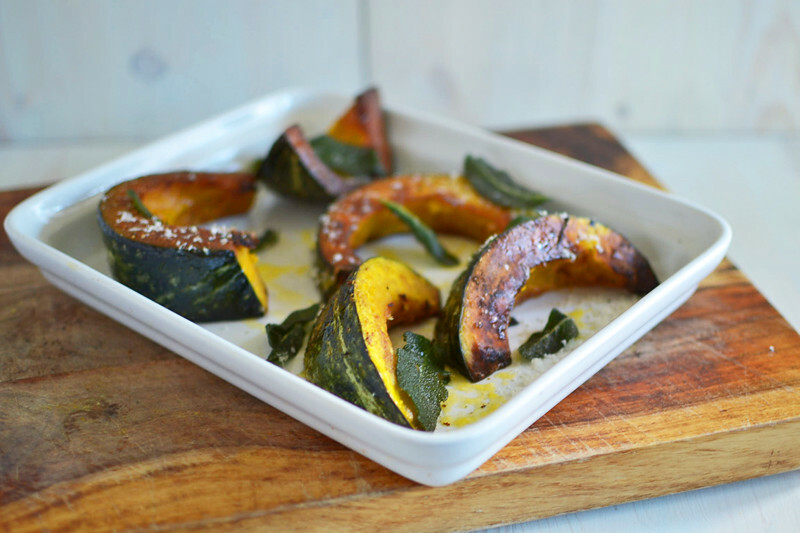 Here are a few recipes with pumpkin and Amarettini. In Italy, they also cook with pumpkin and amarettini. This is wonderful!! Thank you so much! For some reason your webpage crashes out firefox when trying to pin your recipe to pinterest using the firefox extension. Just letting you know. Hi! Thanks for letting me know. I do see that on my kabocha squash recipe but not the others. Let me work on it! I very much liked to have done, great if it helped a little!